This dish is a baked sweet and sour chicken with vegetables which are carrots, zucchini and bell pepper. Although this chicken is baked, you will think that it is a stewed chicken because this is a saucy dish. 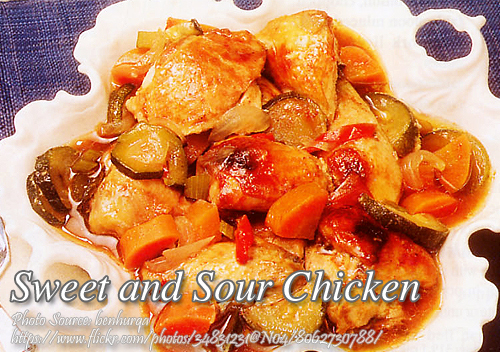 To cook sweet and sour chicken; Preheat oven to 300°F. In a roasting pan arrange chicken. Combine oil, lemon juice, ketchup and honey. Mix well. Brush over chicken. Reserve any remaining mixture. Cover pan with foil and bake in the preheated oven for 1 hour. Remove chicken from pan. Place onion, celery, pepper, zucchini, and carrots in the same roasting pan. Arrange chicken on top of the vegetables. Pour remaining lemon juice-ketchup mixture on vegetables. Continue baking for 30 minutes. Remove chicken from the pan. Transfer vegetable to serving dish. Set aside. Pour pan juice on a saucepan. Stir in dissolved corn starch. Bring to a boil and stirring constantly until thick. Season with salt and pepper. Serve chicken with vegetables and sauce on the sides. Preheat oven to 300°F. In a roasting pan arrange chicken. Combine oil, lemon juice, ketchup and honey. Mix well. Brush over chicken. Reserve any remaining mixture. Cover pan with foil and bake in the preheated oven for 1 hour. Remove chicken from pan. Place onion, celery, pepper, zucchini, and carrots in the same roasting pan. Arrange chicken on top of the vegetables. Pour remaining lemon juice-ketchup mixture on vegetables. Continue baking for 30 minutes. Remove chicken from the pan. Transfer vegetable to serving dish. Set aside. Pour pan juice on a saucepan. Stir in dissolved corn starch. Bring to a boil and stirring constantly until thick. Season with salt and pepper. Serve chicken with vegetables and sauce on the sides. panlasang pinoy is a great help,i love and enjoy cooking.thanks thanks for all your wonderful reciepts.kudos and more power! mukhang masarap itong recipe na ito masubukan nga.